As regular readers know, one of my mantras is: why have one of anything, when you could have two? Lest this sounds, well, Super Greedy, I must state in my defence that I am not talking here about fast cars, diamond rings or even double helpings of Domino's Pizza. I am talking, of course, about celebrations. Like birthdays, for instance. So when the Youngest of the Darling Daughters suggested that she could come down to ours the day after her birthday for a Birthday Plus One, it will not surprise you to learn that I didn't argue. Why have one birthday, I said predictably, when you could have two? The Youngest of the Darling Daughters' favourite flower is the daffodil. On her wedding day, every windowsill in the church was decorated with daffs, every table at the Reception likewise. The wedding cake was topped with daffodils fashioned from sugar paste, the wedding bouquet was daffs mixed with tulips. Her daughter, the Chief Bridesmaid ( or, as her seven year old brother explained in his memorable Best Man's speech: "Actually, she is the ONLY bridesmaid...") wore silk daffodils in her plaited hair. What better place to visit together, therefore, on her Birthday Plus One but beautiful Highdown Gardens, known to all at this time of year as The Daffodil Gardens? I love the fact that there is free entry to Highdown Gardens. Please don't think this reflects on the mean-ness of my nature - I just appreciate the fact that someone loved our town and this garden enough to bequeath it to all residents for posterity, on the understanding that anyone and everyone could wander at will and enjoy the surroundings without payment. Such generosity is Beyond Praise. The Youngest of the Darling Daughters kept checking her watch as we wandered. Could I - terrible thought - be boring her? Then I realised she was consulting, not her watch, but her new Fitbit, a gift from her Other Half (known to you all as Dunk'em Dave, on account of his watery activities on many a Family Beach Day. He does, I hasten to assure you, have many other Sterling Attributes, much appreciated by his Mother in Law. That'll be me, then.) Only one day in and my daughter is determined to accumulate as many steps as possible, however many times we will need to traverse the gardens In pursuit of Fitbit Perfection. We took lots of photos as we wandered, including one "selfie" in which my daughter urged me to crouch down, so as not to impede the views of the host of golden daffodils behind us. My face is a picture, contorted in discomfort as I try to work out whether I will be able to straighten up afterwards without a helping hand. 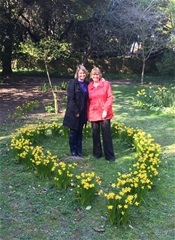 A passing group agreed to take a photo of the pair of us standing in the middle of a daffodil bed in the shape of a heart. The Youngest of the Darling Daughters looks slightly taller than me - this is either because I am shrinking in my Great Age or because she is cunningly standing on a submerged tree stump. Sitting on one of the many benches helpfully situated around the gardens, my daughter decided we needed to relax. By which she meant relaxing Fitbit style. She held out her wrist so that we could both see the Fitbit on which was a heart shape expanding as we inhaled and contracting as we exhaled. This was altogether too much for the pair of us. We were convulsed in giggles and spluttering with every breath. Both inhaled and exhaled. We repaired to the Tea Room for a recuperative cuppa. No, we didn't avail ourselves of any of the cakes and pastries on offer, delicious though they were, because earlier we had enjoyed a hearty Pub Meal with Mr B and, besides, we needed to save ourselves for the birthday cake I had baked. My granddaughter, Hazel Bagel, had also baked her Mum a cake for her actual birthday - but you know what I am going to say. Why have one Birthday Cake Made With Much Love, when you could have two? Before she left, the Youngest of the Darling Daughters was at pains to organise my Social Diary so that I will have plenty to look forward to in the weeks and months ahead. She has no intention of letting me mope about. Even if I don't have a Fitbit to keep me at it. Thus we have made plans for Mothering Sunday; two more Lunch and Theatre trips to see The Fiddler on the Roof at Chichester and Carousel in London; the Annual Family Beach Day in August; and Hazel Bagel's 18th birthday party in July. Somehow or other I need to fit in a (probably low-key) celebration for my own Signature Birthday. As in, one with an 0 at the end, don't you know? Off she drives, this oh so Darling Daughter of mine, at the end of a wonderful Birthday Plus One, full of love, laughter and All The Joys Of Spring.